As an artist I am always looking at creating new ways to share my experiences with other people. I have personally found that art and digital technologies are a great combination because of the ability to create spaces, objects and creatures from our imagination in a 3 Dimensional environment. The ability for the observer to walk around and interact really changes the depth and emotion we as artists are able to portray by bringing ourselves and people into our own self created universe. Creating worlds from our dreams and visions are some of the most powerful ways we can express ourselves and share our perspective when we and others are looking at what we have created. As a potential for creating a better world through art, VR is an extremely powerful and moving platform, with the ability to change the way we perceive the world and our own subject experience of existence itself. Virtual reality combined with art is the first step in evolving our language into something which is perceived and understood, a 3 Dimensional language. Beautiful visual meanings are beheld alongside acoustical meanings. We have the possibility of changing our species for the better in a profound way. If we could see with our eyes what each other means, there would be no miscommunication. Our 2 Dimensional language does not suffice for truly sharing how we feel or what our subjective experience is; cyberspace is the cure for this as it connects each one of us to each other in a world built from light where we can share and build freely with no constraints. If we can dissolve the boundaries between ourselves and each other, we can all work toward a common cause, and a new true vision of humanity will be possible. But first we have to objectify our language. A culture can only evolve as fast as it’s language evolves, and we must build new bridges in the ways we can communicate to our species and to others. Building linguistic pathways and creating new modes and meanings of communication will advance our language much more than we can anticipate, once our language is beheld it will change the way we relate to everything. If we succeed we will breakthrough into a new dimension of understanding, it will create a more true dynamic, integrated, cybernetic, loving, psychedelic, intellectual environment for all of us to co-exist in. I am always trying to expand the creative outlets for my art, and ways to share my experiences. My journey into VR started very simply. I had decent tech skills, but little money. Not letting that stop my desire to be a part of this radical transformation that is happening around us – to be a part of the creation of this new technology, not the slave of big business and wall street- I decided to search out methods and technologies which would help me achieve my goal of transforming the way I can communicate my ideas with other people. 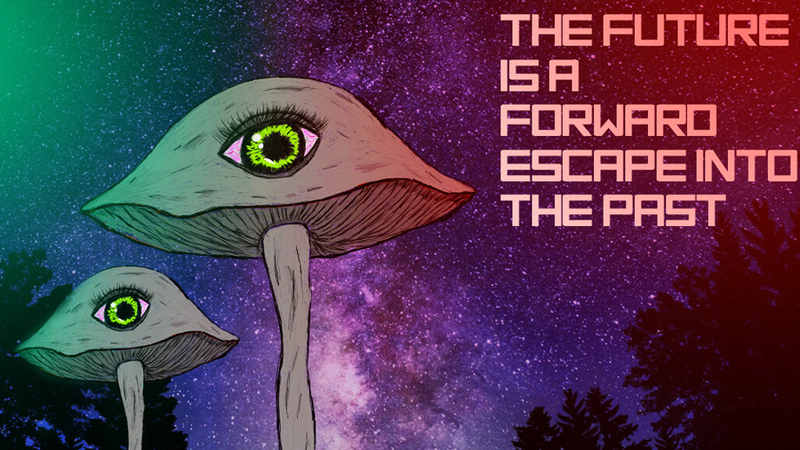 In my practice of Shamanism, the eating of psilocybin mushrooms and ingesting cannabis gave me intense insight into how limited our cultural assumptions are with language and that if we desire we can break free from the models of the bourgeois. Psychedelics taught me about the importance of myself and that the world we create and share with others is designed by our languages and that if we can change the code in which our language is made of we can transform the reality as we know it. By learning how to 3D model and sculpt memories from my mind palace, I have been able to share a truer vision of who I am and what my perception of this reality is. Discovering VR has completely changed the way I see the world and everyone in it, I am truly looking forward to a day when we are more enlightened and able to communicate through telepathy in 3 Dimensional language. We are seeing the birth of a new planetary scale transformation, and it’s very exciting to be apart of it. I think VR is a radical, fun way to start creating the future we want and it will allow us to look at the human soul as an eternal transdimensional object that we can merge with others and create a new understanding of who we are in the cosmos. Drawing, wood burning, 3Dprinting, 3D modelling, painting, makeup, hairstyling, and evolving my personal aesthetic has been a really interesting journey, but the best part comes from being able to incorporate all of these creations into a much more solid form, Virtually. By scanning myself and objects I’ve made by bringing them into hyperspace in the metaverse, I have immortalized these ideas. Coding them into a virtual space that I’ve spent many hours living and working in. Transcending the limits of the biological realm, in the digital realm (which is no less real than the dimension that we exist in that isn’t virtual) has been an exhilarating and arduous journey into the mystical and the psychedelic. Mind stretches outwards and inwards beyond our brains into these technologies that have allowed me to unify the technological and the biological world by combining my artistic creations and capturing my memories, dreams, visions, nightmares, fantasies, and anticipated futures. How we browse and interact with the internet is evolving at a fast rate. JanusVR is a web browser designed byJames McCrae graduate from the U of T, which allows you to look at the web in a new way, in 3D. The technology to be able to share our imagination with friends, family, and our communities is already in place today. JanusVR has the ability to interact with the internet that is in place today by using HTML + Firebox rooms to create a 3D experience on the web, in virtual reality. JanusVR has a multiplayer server so artists and people can interact with objects in real time when connected to this default server. Locomotion in VR is something JanusVR has worked hard to solve, using a portal system to move from website to website with searchable party mode abilities so you can find out where others are. Mindscapes and topological environments from our imagination are easy to bring together with a basic knowledge of HTML and 3D modelling. Vesta.JanusVR.com is a free hosting server for people who do not own their own websites but still want to share content. It’s free to sign up and has no cost for hosting files and has a built in HTML editor so it streamlines your ability to edit your files. It’s 2017! Let’s use this opportunity to connect with our communities and see if we can move the human race forward and invigorate the VR community (which is lacking large amounts of content). Let the voices of our communities reach out to everyone and anyone who wants to create art and share their experiences with the world. Transforming our reality is ultimately up to us, as the world is made of linguistic structure’s, let’s use our vocabulary intellectually and creatively to create a bright new model for others to see and hear across the meta-verse. Anyone who is interested in designing art in 3D can talk to the JanusVR team on the community Discord, or Subreddit about how to get started! Not only are you able to design your art in a new way, but you can also bring existing art works into cyberspace too, using a phone or camera to capture your artwork as an image or a 3D model and then bringing it into Janus.